Slept as late as possible, still leaving enough time for a free breakfast, then had a meeting with a new partner/friend, then a drive back to DC, sat around a LONG time at Sam and Harry’s waiting for our departing flight. Finally caught it, non-stop to Vegas, arriving after 11:00. Picked up our rental car, a nice little Mazda, arriving at the Hilton Garden Inn after midnight. Took more than an hour to wind down enough to sleep, even then it was unsettled. Long day! Finished up our training today, then headed back to the hotel. Walked around the corner to one of our favorite all time restaurants, Lehja, because we both LOVE Indian food, and they do it really nice here. A great training camp, though exhausting as always. Not much time to recover this time, flying straight from here to Las Vegas for another job! Busy, busy! Slept until just before 9:00, then hustled down for the free breakfast here at the Hyatt House Richmond West, our favorite hotel in this area. Ran out to do a little shopping, then spent the rest of the day preparing for our training camp tomorrow, and resting as much as we could. Here are a couple of pix of our new backyard. Another business trip scheduled, flew from Palm Beach to Reagan National in DC, rented a car and headed down to Richmond, VA for a job down there. Did a little shopping, grabbed a meal, then relaxed for the remainder of the day. It’s been weeks since Hubby has taken a ride, as most rides have been on Sundays with my brother, and once with his former step-daughter, so we decided to take the day and run out to Dupuis WMA near Indiantown, one of our favorite riding spots. It was a beautiful day, we got a little turned around on the trail we were heading for, I think because they changed some of the colors on the trails recently, but it was a very nice 5.25 mile ride. A bit short, but enough to get Hubby back in the swing of things, didn’t want to overdue it as he’s been off for so long. Always a good day when we’re on the back of our horses! 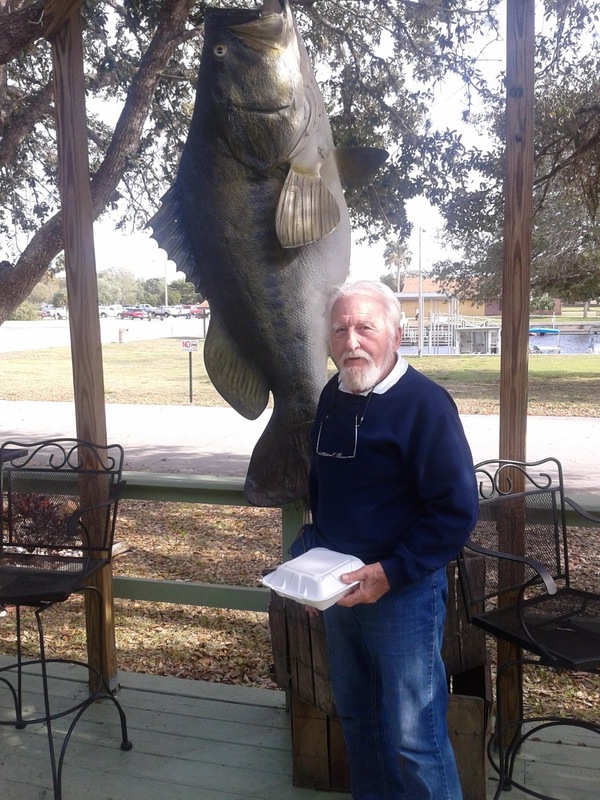 Spent the day running around in Okeechobee, picking up hay, stuff at Tractor Supply, a switch for the new satellite dish (which we turned out to not need because we had one already, but Hubby thought it was something else :- ), and had lunch at a rather strange restaurant called Lightseys. Everyone told us it was the best seafood in town, and it may have been, but the decor was odd and tacky, and the butcher case at the entrance was filled with rather dry, not-so-fresh looking fish. Undeterred, we ordered lunch, though I had asked for the Gator special, but they were out of gator, so I ended up with a rather pedestrian salad. Service was fair, but nothing to write home about. Too windy to sit outside, which would have made it more interesting on a nicer day. Not short of business though, a steady stream of customers while we were there. 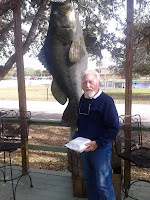 Just HAD to take a pic of Hubby with The Big Fish hanging outside! Highlight of the day! Spent the whole darn day sorting out the connections between the TV, the new satellite dish, the audio tuner, and an extra DVD recorder, not to mention a connection for the old DVR so we can continue to clear it off. Hubby woke up feeling terrible today, dizzy and nauseous, could barely walk without looking like a drunk. Sat him down in his recliner, then to bed for a nap, to try to get his head back on straight. Finally finished the wiring around 6:00. He managed to feed the horses, though I put them away, had soup for dinner before settling down to an evening of recordings. Boring but necessary day. Set the alarm early as we had a lot to do today. Arranged to pick up an new Dish antenna and receiver (free upgrade to HD, can’t pass that up now that we have an HDTV in the new RV), plus stops for breakfast at Burger King, fuel, Walmart, NAPA auto for a new part for the truck, and the RV Home Depot for odds and ends. Strange, after we left the BK, both Hubby and I started not feeling too well, and one of the dogs got a bit sick in the van after Hubby fed her some hash browns. Not saying there was a connection, but later in the day I felt a sore throat coming on, and Hubby said he wasn’t feeling too well either. May be just a bug, may be something else, no sense worrying about it now. Anyway, we got back to Jeff’s a little after 1:00, got settled in, tried to get the satellite dish set up but it was too late and we were too tired, so we abandoned it until tomorrow. Spend the evening watching stuff on the old DVR, something we’ve been doing for a couple of weeks now, to clear off all the recordings we’ve accumulated. Only about 35 hours left on it, but I suspect some of it will just be erased, not that exciting anyway. Bedtime came early after an early morning. Monday, Feb. 11, 2013 – Long, Fabulous Ride Today! Had a good night’s sleep, then saddled up after breakfast to take our final, and hopefully, longest ride. Despite being ridden more in the last week than they have in the last few weeks, the horses were quite happy to get out again after their day off, at least once we got on to a new trail. After taking the usual half mile or so of Blue trail, we took the north Orange loop, doing lots of trotting and cantering (and even a short gallop!) until we came to the primitive camping area, which is pretty much in the middle of the park. There is a pavilion and a hand pump with a trough, plus an extra picnic table or two scattered around. There was also a ranger and his pickup truck there, spraying some unwanted foliage around. Hubby and I munched on a couple of chicken sandwiches I had made, gave the horses a couple of apples, and then two more riders came in. Two women, Pam was one of them, who had started on the west side of the park (we had come from the east), one of them apparently has some land over there, so they can reach the park directly from her stables. We chatted a bit before heading back out on the trail, this time taking the part of the Orange trail we had missed on Saturday, the south route as it were. We got a lot more trotting and cantering in, avoided some black snakes (I’ve seen a lot of them around here), and arrived back safe and sound around 4:00. Gave the horses a quick bath (their third since we’ve been here! ), spent a little time getting ready to leave tomorrow, then settled in for the evening.